Native to North America and used in many purposes by Native American cultures, the “chokeberry” was named by early European settlers due to its tart, astringent taste. Once used for everything from medicinal teas, to dyes, to curing meats, to dried nutritional treats in long winter months for Native American tribes, the “chokeberry” was driven into relative obscurity in North America due to urbanization and the commercialization of U.S. agriculture during the 20th century. Recently, the strong potential health benefits of the fruit, most notably its rich antioxidant levels, has revitalized interest in the superfruit. The aronia berry has one of the highest antioxidant values ever recorded, higher than cranberries, blackberries, raspberries, blueberries, and pomegranates, among others. The aronia berry is also a rich source of folates, Vitamin A, C, E and K, as well as calcium, iron, manganese, potassium, zinc and phyto-nutrients. 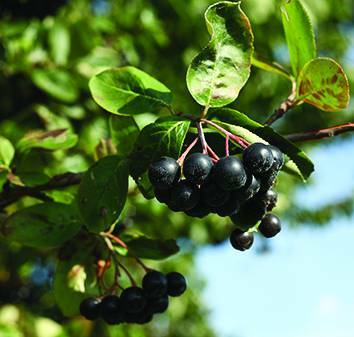 In 2014, to better position the fruit for consumers, producers went back to chokeberry’s genus, Aronia melancorpa, to reframe the “chokeberry” to the “aronia berry”. The aronia berry is now being used for both its flavor profile and nutritional benefits in everything from kombucha, to smoothies, to lemonade, to coffee, to liqueurs. One man ahead of the curve was John Pilcher, of Crete, Il. John and his wife, Mildred, founded Coldbrook Farm in 2008 on 35 tillable acres in Kankakee County, IL. They planted aronia for the first time in 2009 and in 2011 harvested their first small crop. Today, they grow over 10,000 aronia plants on 13 acres. After spending the majority of his adult life working as a tax advisor, John was ready for his own second act as a spry 60-year-old with a lifetime fascination with fruit. When asked “why aronia?” John simply states, “When we got our ground, I wanted to grow something on it that was interesting…and aronia had such an interesting background being originally a Native North American plant and its positive health characteristics”. Today, at Apologue we source our aronia berries for our Aronia Liqueur from John at Coldbrook Farm. Based on John’s insight that frozen aronia berries elicit a more pleasant interplay of tartness and sweetness, we receive the whole berries frozen and then press them onsite at the distillery to blend directly into the final liqueur. Being a small part of the revitalization and education around an overlooked Native American fruit is something we’re proud to include in our first act as we support the aronia and John in their seconds.